* This sets the random seed at 101. Thus every time this simulation is run it will product identical results. 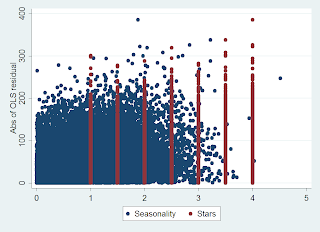 label var star "Number of stars of hotel"
label var het "Unobserved heterogeneity." * Generate a the number of reservations observed per hotel. 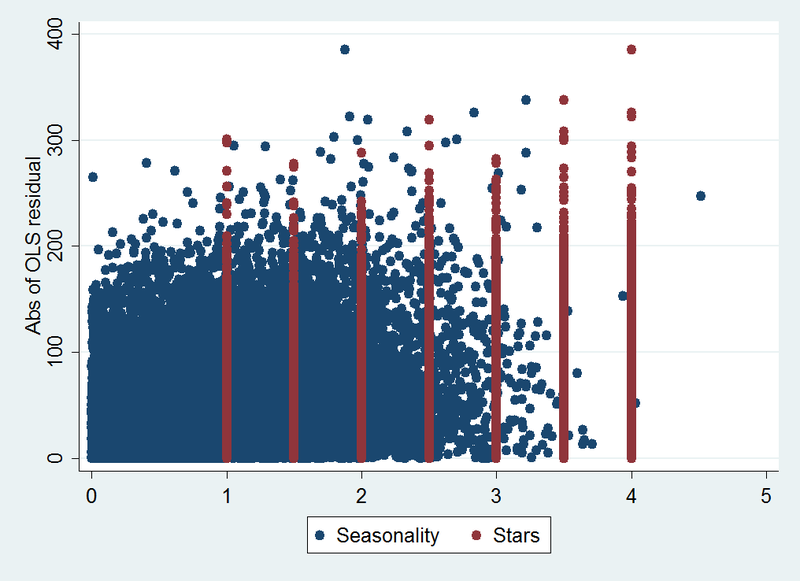 label var seasonality "Seasonal demand"
label var v "Unobserved variance in the variance term"
label var u "Error term"
* There are some p values which are less than 0 but we can think of those as special deals, coupons, refunds, or other situations that might result in the effective price being less than 0 dollars. * If we were to eliminate the less than 0 prices then we would in be enforcing left censoring which is a different problem. See "tobit". This blog has several posts touching on the use of the tobit. * Though we have panel data we cannot effectively use fixed effect or random effects approaches to identify the price effect having one more star has on prices. * Now let's attempt a two step method to more efficient identify the error and reestimate the OLS. * The OLS regression looks pretty good. Let's see if we can improve on it. Note, the 95% confidence interval did not capture the true coefficient of 20 but that is not necessarily a problem. * Using robust and cluster robust estimates of the standard error does not change the variance so much that the 95% confidence interval encloses the 20.
label var uhat_abs "Abs of OLS residual"
* Alternatively we can use the MLE estimator allowing the conditional standard deviation of the error as well as the conditional mean to vary linearly. * Using the MLE estimator we seem to have gained precision in the 3rd decimal place of the coefficients. The 95% CI still does not enclose the 20 but it is closer. Still, this is not indicative of a problem. Perhaps if we simulated this 1000 times and substantially more than 50 times the CI did not enclose the 20 then we might be worried.